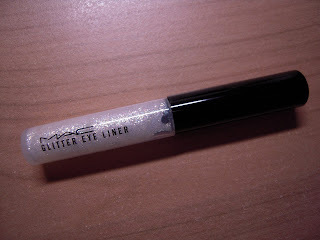 The glitter eye-liner I used is MAC's Spunsilver, and even though I had no previous experience with glitter liners, I must say I really liked it, as it was really quick and easy to apply. Word of caution though: it is a bit tricky to remove... but then most glittery products are...! I always wanted to try gray/blue smokey eyes :) thanks for the comment, too! I think you look beautiful; wow you have really beautiful eyes! Love the glitter liner!! The Body Shop bring a glitter liner out at xmas and its pretty similar, looks fab on you tho! !